You'll love the versatile style of the right on trend L*Space Beach Weekend Bag in Black. The round woven beach bag is a must have this summer, made of 100% Straw with contrast tassel detailing in One Size. 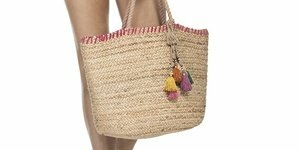 The L*Space Beach Weekend Bag in Black is a round woven beach bag made of 100% Straw with contrast tassel detail.